Every year on special days, pet food and treat companies, or other novelty types of companies, come out with treats for owners to give their dogs. Unfortunately, not all of these treats are safe, and some can even be dangerous or fatal to the pets in your home. 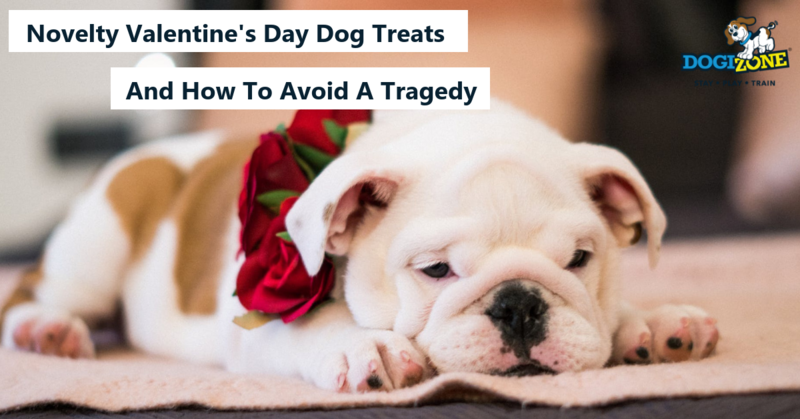 Recognizing the potential danger of common and even some uncommon Valentine’s Day treats for pets can help you avoid an emergency trip to the vet and help to keep your pet safe and feeling loved on this very special day. Most humans love an amazing box of chocolates for a Valentine’s Day gift. Unfortunately, even a small amount of chocolate, including both milk and dark chocolate, can be deadly for dogs. It is impossible to know how a dog will react to eating chocolate until after the candy has been consumed. Typically, the smaller the dog and the larger the amount that has been eaten, the greater the risk. The biggest immediate issue with dark chocolate is the presence of methylxanthines. These chemicals act like caffeine in the dog’s body, even in very small amounts. The result is heartbeat irregularities, digestive distress, neurological dysfunction, seizures and if enough is consumed, eventual death. Keep all chocolates away from dogs. This includes candy dishes and boxed or wrapped candy as well as baking chocolate. While humans may not enjoy a beautiful rawhide heart or cupid’s bow, they are sold at pet stores. Rawhide is the inner layer of beef hides removed before the hides are made into leather. Rawhide is bleached and treated with chemicals and then dried, rolled and infused with artificial flavors before being baked. The result is a very hard material when dry, but when it becomes wet from the dog’s saliva, it becomes a stringy, soggy mass. Dogs can easily swallow this mass. It can lodge in the throat and cause choking. It can also be swallowed and enter the stomach or digestive tract where it causes blockages or full obstructions. It can take in excess of 24 hours for this to digest, and with a large enough mass in the stomach, it may require surgery to prevent death if a full blockage occurs in the digestive tract. Another favorite for Valentine’s Day is stuffed toys. While some dogs are very good with toys, most dogs chew and bite. With toys designed for people, the buttons, bows, eyes and other features can easily be swallowed by the dog, resulting in choking or digestive issues that can be potentially deadly. If you do want to celebrate Valentine’s Day with your dog, just be sure to give a safe, pet-friendly type of gift. Special dog Valentines treats are available that are great tasting, safe and nutritious, and are a gift your dog is sure to enjoy. If you want to get a gift but aren’t sure what to get, stop by our store and we’d be happy to give you advice. Also on your shopping list should be Bark!, a locally owned pawsitive pet food store. Let their knowledgeable staff guide you to the best foods, treats and supplements for your dog. Comment on our social media pages. Facebook, Twitter & Instagram. This entry was posted in Health and Nutrition, Resources and tagged dog toys, dog treats, love, Safety, valentine's day. Bookmark the permalink.